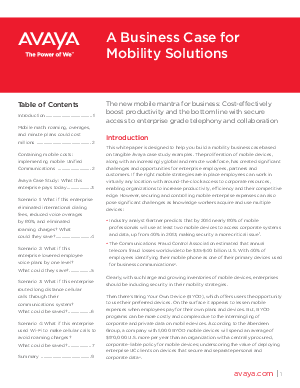 This white paper is designed to help you build a mobility business case based on tangible Avaya case study examples. The proliferation of mobile devices, along with an increasingly global and remote workforce, has created significant challenges and opportunities for enterprise employees, partners and customers. If the right mobile strategies are in place employees can work in virtually any location with around-the-clock access to corporate resources, enabling organizations to increase productivity, efficiency and their competitive edge.